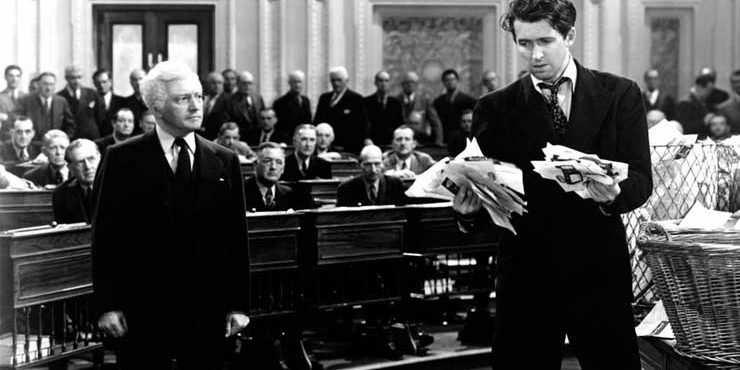 From the film "Mr. Smith Goes to Washington." Whenever there is a government program that doesn’t work and/or is failing miserably we hear the word “reform”. Notice we do not hear words like “elimination”, “retract,”” remove” or” dump”. The premise is the law must be saved and can be made better. This faulty premise has led to the expansion of government powers under the disguise of “reform”. This will cost more money to establish and implement. It will require more government power to enforce. And it will not end here. If the new office is not effective ( which it won’t be ), there will be investigations and hearings to find out if the people running the office and the investigations need more money, have any concerns, need better facilities, etc. In the mean time the legislature will find that there are some people that are not covered or not getting care and there will a need to put more money and of course more regulation to avoid fraud in the expansion of benefits. There will be the cost of incarceration for those trying to bilk the government and that requires expanded prison facilities, more judicial time and more public defenders. Multiply this times the attempts to reform hundreds of other government programs at all levels of government and you can see the expansion of government accompanied by the needed spending is exponential. Thus the land of the free is rapidly becoming the land of the regulated. The same citizens that in times past were working and earning in a free market are now government agents spying and arresting their fellow citizens because ( thanks to legislative initiatives and reforms ) that now is a better paying job. Reform is only applicable if something is fundamentally good but needs a tune -up. Government redistribution of wealth schemes are never good. The other side of every equation associated with a government “benefit’ is the question , “ where is the money coming from?’ or more exactly, “ Who are we going to have to take it from?” If every time Congress said it was going to provide something, it had to declare whose hide it was going to come out of there might be a little more concern with this wealth redistribution nonsense. But since chicanery knows no ethics, disclosure of the real scam is hidden under blankets of obfuscating rhetoric. “ We may have to revise our projections”. “We need to take a hard look at the priorities”. “ We must act responsibly, not hastily”. Ad nauseam. The way this state of affairs got this way holds a clue how to reverse the trend. When reform pops up it must be questioned right down to its roots. Perhaps reform is not what is needed at all. Maybe the issue is one that needs total elimination. Take the tax code. Bundles of regulations and interpretations of multitudes of schedules and forms. Misunderstood, misinterpreted and costly to implement and decipher. This the result of multitudes of reforms that have only compounded the unworkable. Why not begin at the beginning and ask such questions as what brought us to this tome of babble? Fundamentally why should any organization of man require that it be paid for by confiscation? What does government do and why are its services the only ones that sanction legal confiscation? Why wouldn’t people voluntarily pay protection from physical harm? People volunteer for military service. There are voluntary fire departments. There are private security organizations. Why not a voluntary financed government? Who preaches against it? The government primarily, just as they preach against competitive first class mail delivery, competitive education and competitive passenger rail transportation. They have a support from people in academia and the media who think government can be all things to everyone but the reality is they fail miserably when they attempt to take over commercial endeavors where competition lowers prices and promotes efficiency. Where competition is forcedly excluded the results are always poorer. The only meaningful reform of government meddling is to completely re form the structure of government. This means limitation of its activities to conform to it nature. No business can compete with government. The two are separate and apart. Government deals with the initiation of force ( an agency designed to protect from the initiation of force ) and cannot include the same kind of acts it is created to discourage. If you don’t want criminals breaking into your house without legal sanctions neither do you want government agents breaking into your house without legal restraints. If you want a reliable payment in your retirement years you cannot rely on a capricious government that spends more than it takes in to have the funds to provide it. The current reforming of government is merely a facade for expansion. The only meaningful way to reform government is to limit it and keep it out of the commercial arena. We have seen government try to control economies in countless countries over centuries and they all failed. They transitioned into welfare states to buy votes, they were unable to control the costs of their redistribution schemes and as they became more corrupt, the populace called for a reformer who tried and convicted the corrupt, instilled a terror regime or dissolved into balkanized warring parcels. This has been the end result of a reform movement that wouldn’t question the role and function of government and only relied on tweaks to repair the damages created. No one tunes up a car that needs a complete overhaul and this is exactly the analogy we are faced with in the politics of America. We are putting in spark plugs to fire compression chambers that are exhausted, where pistons are broken and bearings worn out. We are reforming the engine that needs a complete overhaul and we are wondering why the damn thing won’t run. The answer is simple. Just as a car requires a recognition of what it takes to make it run so too does a government require a recognition that it is not a magic cauldron of funds to be dispersed, an agency to regulate economic activity or an endless feeding trough for non-producers to line up and gorge. The next time you hear the word “reform” regarding a government program ask if reforming the program is really the answer. The Social Security program was “reformed” in the eighties ( via more taxes ) and it is still projected to go broke in the not too distant future. What did that extra revenue accomplish for those now facing its demise? It didn’t reform anything. It only expanded the government’s revenue collection and ultimately it’s power over individual productive citizens. Future “reforms” will do no better. Potential Secretary of State: DNC Hack was "False Flag" Operation by Obama!Trump's Favorability Ratings Reach New Highs!